This is a big week for us as we start promoting our book. On Saturday, August 8th, we’ll be at a booking signing at the Barnes & Noble Cool Springs at 1 PM. We hope you’ll come join us. Whew, what a year we just had! God has truly blessed us in every aspect of our lives. We had our 34 month adoption journey come to an end when our kids landed on U.S. soil on March 19, 2013 that was definitely the biggest blessing on our lives to date. What has followed since that 19th day in March has confirmed in us that we are walking in obedience on a daily basis to God’s will. We have a theme that repeats itself over and over again in and around our home, it’s the word “BLESSED”. Their’s just no other better explanation for God’s grace shown on our family. When we heard the call of adoption and God telling us throughout the entire process to do more, we never dreamed this is what He had in store for our lives. We endured a dramatic roller coaster ride of emotions throughout the adoption process that no adoption class could have prepared us for the battles we faced. The battle we shared walking along with a hand full of other families, and reestablishing a process of adoption again within a country that was closed to adoption, was almost unbearable at times. Experiencing a single step forward would catapult you to a new mountain top one day, while plummeting you back into an abyss forcing you three steps backward in the adoption process the very next day. This was so draining and monotonous that we, at times, were in our own little shells waiting on pins and needles to see the light of the next day. I don’t want to scare people away from the adoption process, but I don’t want to paint a rosy picture of an adoption process that seems like filling out some paper work and bam, you’re done, instant oatmeal family. Independent adoption, as we experienced it, was a tough and a very grueling process. Yes, the rewards are well worth the battle and 201 million orphans world wide need loving family homes. Some may not be “called” into adoption. There are numerous ways you can get involved with orphans: foster care, supporting a child related non-profit organization, mission trips, financially supporting a child, spending time mentoring a child, or even through community food banks. Our family was called to adopt. God specifically spoke to us throughout the process. He had to walk with us on our journey to adopt eight gifts from Him all at one time. We see the fruits of our labor we endured because of the strength He gave us each and every day. It’s affirmation when you see the glow in their eyes looking back at you each and every morning when they wake up. They were perfectly sent from our heavenly Father, just for us. Adoption does have struggles as people and children are not perfect, we are all flawed from man’s first sin in the Garden of Eden. There are horror stories out there that are real and situations occur everyday throughout the course of adoption as does with raising any child. Parents don’t need to be naive in their expectations and they need to hear about other family circumstances so that they are aware and observant when bringing adopted children into their homes. Children are a forever commitment and not a disposable option. Adoption doesn’t give you the right to return a child. Adopted children all have a past and at some point in their lives, they were broken, they need families to help them heal through the grace of God. We are fortunate enough to have eight new family members that when people ask us, ” How is everything at home? How are they adjusting?” We can honestly answer that it’s wonderful. From the very first visit to meet our children back in 2010, the kids just bonded and clicked with our family. God has made this transition remarkably smooth. We are all at peace. 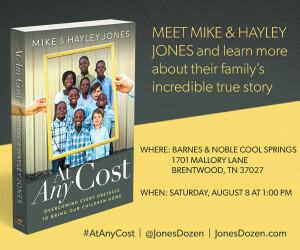 People often will say, “You are such amazing people for doing what you’ve done.” It’s not about Mike and Hayley Jones and who we are as humans beings. We fall short every single day. It’s definitely a God thing and to Him be given all the glory for what He’s done in and through us. We are simply vessels being steered by God. We aren’t Bible scholars or prophets. We are just common, ordinary people called to adopt, that acted in obedience to what we were called to do. I guess the simplest way to describe what might not seem rational to most, is that we have faith, and just want to follow and serve Him. We didn’t sit around and contemplate what was asked of us. We simply jumped up and put one foot in front of the other and began to walk the path we were given. Another thing people will ask is, “You all must be rich.” We didn’t jump into adopting eight children into our family because we could financially make sense of it all. We are not financially supported by the Federal Government in any form or fashion. We are supported through what God does through others for our family. As the saying goes, “It takes a village to raise a child,” it’s absolutely true. We have had random people come up to us at times in the grocery store and hand us cash or gift cards. God uses others to fulfill the daily needs that we alone cannot financially provide. Its is amazing and truly humbling to not know how we are going to make it and then it’s provided. When you try to do a budget it doesn’t financially add up with what’s coming in and then what’s going out, but our needs are met. When God’s provisions are given to you by complete strangers, it leaves you speechless and dumbfounded by God’s graciousness shown on you and your family. We have to be good stewards with God’s provisions. We don’t go asking for hand outs and are extremely sensitive to the needs of others that are also in need around us. To see God work through other people in our lives is astounding time and time again! We can’t help but worship Him for His faithfulness to our family. These people that give to us will tell us they don’t know why, but they are supposed to give this to us. That’s the Holy Spirit working in them to provide for our family and it gives us chills and goosebumps to see Him at work. God is so good to us, we are truly honored to look around and see His blessing being given to us! Our prayer from our family to your’s for 2014, is for you to be able to come to know Him better this coming year. If you don’t know God now, don’t wait, start today! If you believe in God but maybe have wondered or lost touch, find a body of believers (a local church) and worship Him there. The Bible says to surround yourself with believers. Get into God’s holy word, the Bible, it connects us to Him here on earth. Even if you don’t like to read, start with just a few words or even versus a day. There are numerous apps out there that will help you begin to grow deeper in your understanding of the Bible one day at a time. We don’t know everything or have it all figured out. Our commitment as a family is to grow in our knowledge of the scriptures this new year. Please grow deeper in your knowledge and understanding everyday of God’s word, it will change your life! This world is only temporary and will pass in the blink of an eye. Heaven and hell are real and eternal, please don’t put off tomorrow what you can do today, choose Jesus now! Blessing to you all for 2014! Channel 2 update story to our original homecoming story which aired on March 19, 2013. Story about Hayley’s first Mother’s Day with all the kids home.